a group of companies that has been successful around the globe. The eleven specialist companies in the group work hand in hand on creative, innovative solutions to improve the value creation of the products. The close relationships between the individual companies save our customers the lengthy coordination among multiple suppliers they would otherwise face. 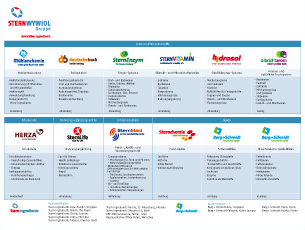 The products made by the Stern-Wywiol Gruppe include functional systems for bread and baked goods, flour improvers, enzyme systems, stabilising systems for deli foods, dairy, meat and ice cream, flavourings, functional chocolates, vitamin and mineral premixes, nutritional supplements, feed fats, oleochemical specialities and phospholipids.